[testimonial2 author=”-C. Burke, San Bernardino, U.S.A” + pic=”http://apneatreatmentguide.com/wp-content/themes/atg/images/femaletest2.jpg”]“This is great advice, which I intend to follow. I love the way you approach the topic — from apnea to alternative treatments, from mild to dramatic. went from 20 to 40 to one (!) by sleeping on my side, not my back. Thank you for a great contribution, Marc! 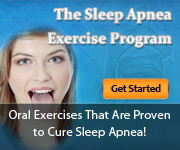 [testimonial2 author=”-Jan, Australia”]“So many thanks for the online information you have provided regarding sleep apnea treatments. Yes, I have them all. I printed the cheat sheet and everything else I could see on the website.